Calling Symfonia a international melodic power metal super group would not be far from the truth. Consider the talent in question: Timo Tolkki (ex-Stratovarius) on guitar, Andre Matos (ex-Angra) on vocals, Uli Kusch (ex-Helloween) on drums, Jari Kainulainen (ex-Stratovarius) on bass, and Mikko Harkin (ex-Sonata Artica) on keyboards. These are some the best musicians of the genre in the last 20 years. Therefore, the bar has been set quite high for their debut In Paradisum. With even the most cursory listen, Symfonia delivers upon expectations if only because of the great talent and the typical European power metal produced. Fans of each member (and their past bands) will certainly be in paradise with In Paradisum. Yet, something strange lingers within In Paradisum. While generally this is solid stuff, at times it seemed I was getting the music of novice band. Listening to the openers Fields of Avalon and Come by the Hills made me think of the early and rather rough attempts at power metal from Germany's Edguy. (And little did I realize how much Matos can sound like early Sammet as well). Later, the rather average ballad Alayna (the closing one, Don't Let Me Go, is much better) and predictable Forevermore didn't help my consternation. Add to this Harkin's repetitious use of harpsichord-like twinkling throughout, and I was more than a bit mystified by the content of In Paradisum considering the authors. But, conversely, on other songs, Symfonia shows how the greatness of the whole is the sum of its superb parts. Santiago is magnificent, pure power metal magic mixed with some progressive nuances. Then two awesome songs, Pilgrim Road and Rhapsody in Black, show how the best melodic power metal ultimately entertains and charms by an infectious groove and catchy hooks. Played live these two songs will take the audience by storm. Even I Walk in Neon could have the same effect. Yet, with the comments of these two paragraphs taken together with several listens, on In Paradisum Symfonia still delivers the goods (as a super group should): pure European melodic power metal in all its bombastic grandeur and glory. Fans rejoice! Recommended. 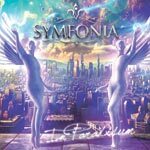 On In Paradisum Symfonia delivers the goods (as a super group should): pure European melodic power metal in all its bombastic grandeur and glory. Fans rejoice!